Beyond Simply Adult Dry Dog Food Rich in Chicken with Barley combines carefully selected natural ingredients with Purina expertise to create a range of 100% complete dog food that you can trust and that your dog will enjoy. 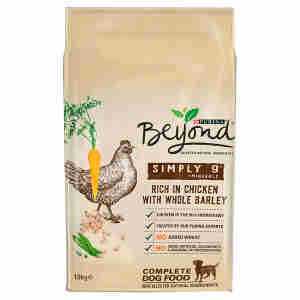 Beyond Simply is made with high quality chicken and is the first ingredient in their chicken recipe. Not only is the chicken delicious, but it also provides essential amino acids to maintain lean muscle mass and support a healthy immune system. No added artificial colourants, flavouring or preservatives. These amounts are guidelines only. To help keep your dog in an ideal body condition, adjust according to your dog’s activity level, physical condition and individual needs. Clean, fresh water should be available at all times. To monitor your dog’s health, consult a veterinary surgeon regularly.